BounceFIT is the perfect tonic for a busy mum. Mood-enhancing exercise, a welcoming and friendly class and a bit of escapism, it’s a little bit of you-time in a hectic schedule. But don’t just take our word for it – here’s Gems to tell us more and answer the questions you really want to know…..
Gems, you’re a first time Mum – congratulations! Tell us a bit about yourself and your little one? I am 29 and I have an 8-month old called Max, who is very cheeky and loves watching me bounce. 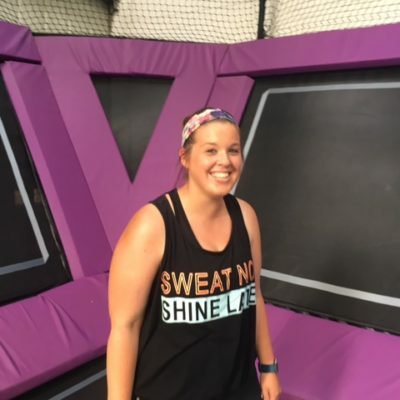 I live in Seaford and come to Bouncefit at Sky High every week, sometimes even twice a week! How did you discover BounceFIT and what is it you love about it? A mummy friend of mine (Zoe) asked if I fancied trying it out, but we were both very anxious about going as we thought the whole jumping on a trampoline exercise after having a baby would not be such a good idea. We both went for the first time in February and have been to the class every week since. Why do you do BounceFIT rather than go to the gym or for a run etc.? 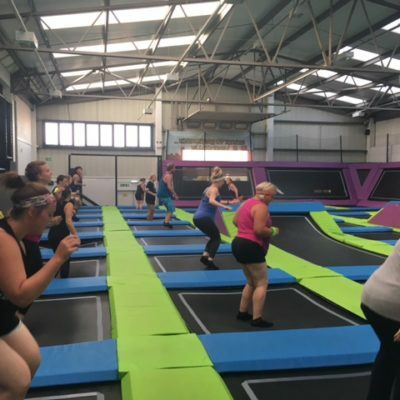 The BounceFit class with Ria is great, you have a whole body exercise in the space of 45 mins, using high intensity interval training, so you’re not bouncing all the time. You also work on your core, arms, chest and back too! It is so much more fun than going to a gym. I find the gym so boring and when there are 20 other people bouncing around in the class, it is such a great buzz! I also run now, in addition to BounceFit, but I could not have done this without attending Bouncefit as it has really brought my cardiovascular fitness level up. Pregnancy, childbirth, the postnatal period puts our bodies through a lot – has BounceFIT helped you to get your body back to pre-pregnancy fitness levels and back into your clothes? Has it helped with body confidence? 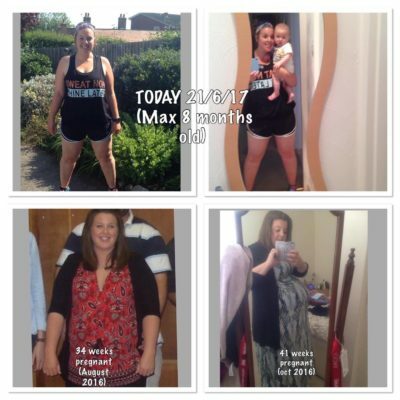 Yes, an awful lot, since having Max, I have lost just over 3.5 stone, that is obviously eating healthily too, my clothes fit better and my muscles that went during pregnancy are getting toned and I am now happy to wear a vest top rather than a baggy t-shirt. What’s the atmosphere like in a BounceFIT class? How do you manage childcare whilst you are at BounceFIT? My mum normally looks after Max when I go to the class, but quite often she brings him into Sky High to watch me do the class. I usually buy my mum one of Sky High’s lovely coffees and then they both sit on the cafe balcony and watch every one bounce around. Max loves it he even bounces around on my mum’s lap! The dreaded pelvic floor issue…. many mums are put off bouncing of any form on a trampoline, because of stress incontinence. Were you worried about that when you came to your first class and is it an actual issue? Like I said my friend and I were very anxious before we started our first class, but we took it slow to start with and Ria gave us alternative/ lower impact exercises to ease us in for the first few weeks (Ria is a mum herself and understands the whole pelvic floor issue) Also as long as you are prepared before class, and you work to your own pace, it is fine. There are also toilets literally 10 metres away if you need to go during the class! Has trampoline exercise helped to improve your pelvic floor, because of the muscle activation/clenching/toning? How much has it improved since you first started? Yes, it definitely has, from starting in February to today, I would say my pelvic floor is 80% back to where it was before I had Max. So if I keep going I am hoping it will be back to pre pregnancy. Every week it feels like I can do more and more harder exercise without having to worry. it definitely strengths the pelvic floor! 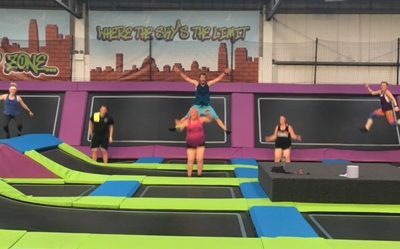 The science bit: Trampolining is an increasingly popular exercise for its cardiovascular benefits and for the fact that it protects the joints from the fatigue and impact of exercising on hard surfaces (such as running). Exercising on a trampoline is reported to be an effective tool for weight loss as well as detoxification of the body, improving digestion and elimination, and promoting lymphatic flow. But more recent evidence suggests it can also help to build up the pelvic floor. The clench/squeeze/hold motions that the body naturally adopts when exercising on a trampoline can replicate the Kegel exercises that engage the pelvic floor. Which makes it a miraculous class for mums to join in, because, to be honest, who actually does their pelvic floor exercises…..?